Yamaha’s flagship Montage 7 synthesizer streamlines your workflow and rockets your sound creation and modulation capabilities up to a whole new level. 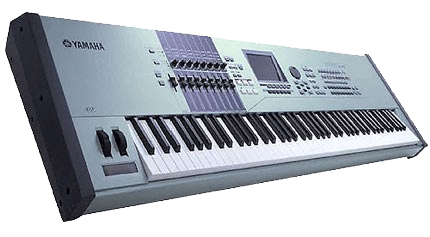 Built on the legacy of Yamaha’s groundbreaking DX and Motif series keyboards, the Montage is driven by its programmable Motion Control matrix, which gives you fluid, interactive command over two powerful synthesis engines. Your fingers will fly on the Montage 7’s superb aftertouch-enabled, 76-note FSX semi-weighted keybed, as you modulate multiple parameters in real time with the aptly named Super Knob. Whether you’re a songwriter, gigging keyboardist, sound designer, or EDM producer, the Yamaha Montage will inspire you and elevate your creative game.